Watch the Harlem rapper perform “Mo Bamba” for Jimmy Fallon. Sheck Wes made his debut on The Tonight Show on Wednesday and delivered a suitably spooky performance for the Halloween episode. Dressed as an undertaker, complete with a black hat and long flowing hair, Sheck Wes creeped his way across Jimmy Fallon's stage backed by a set of dancers and a basketball hoop, a nod to the real life Mo Bamba, to his side. This being network TV, the NBC version of "Mo Bamba" is a little cleaner than the original. Check out the scrubbed-up, curse word-free version above. 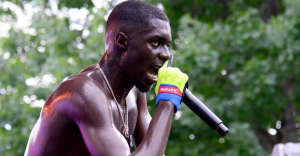 The song appears on Sheck Wes's MUDBOY mixtape, released last month.